Washington’s Garrett DeWees makes the return during a first doubles match, along with partner Ty Rose, against Hillsboro Monday, April 8, 2019 at Gardner Park. 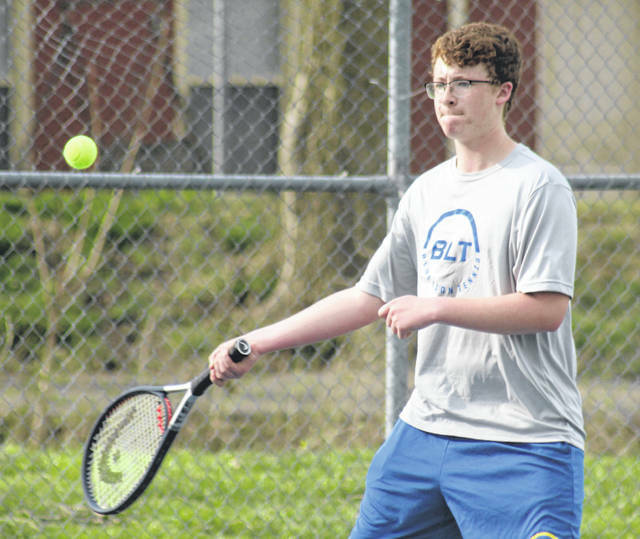 The Washington Blue Lion tennis team welcomed the squad from Hillsboro to Gardner Park on a mild Monday, April 8 for a Frontier Athletic Conference match. Hillsboro won the match, five courts to none. At first singles, Grant Kuhlwein lost to Gabe Gilliland, 6-3, 6-7, 3-6. At second singles, Blaise Tayese was defeated by Andrew Gunderman, 0-6, 2-6. At third singles, Ryan Elrich fell to Tyler Snapp, 5-7, 6-4, 4-6. At first doubles, Ty Rose and Garrett DeWees lost to Ethan Snapp and Austin Pendell, 3-6, forfeit. At second doubles, Sam Schroeder and Olivia Wayne were defeated by Creed Mullens and Gabriel Adkins, 3-6, 2-6. Washington will play at Miami Trace Tuesday at 4:30 p.m.